Reserve your copy of the new book Godfathers of MMA today! What do an NFL star, a United States Secret Service Agent, Sylvester Stallone’s bodyguard, and Muhammad Ali’s sparring partner all have in common? They were all characters cast in America’s original “anything goes” reality fighting drama, an “open call” that lead to the birth of a new sport—MMA. 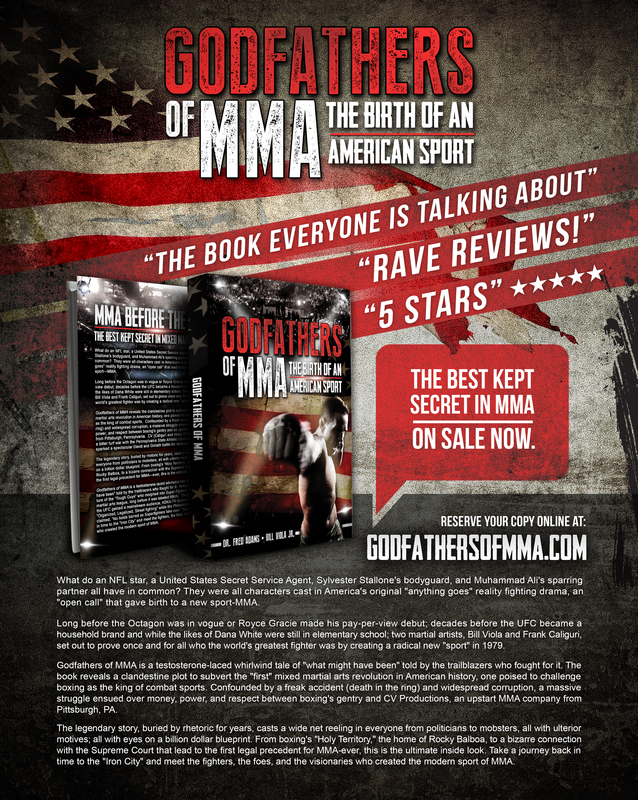 Godfathers of MMA is a testosterone-laced whirlwind tale of “what might have been” told by the trailblazers who fought for it. Relive the epic adventure of the “Tough Guys” who morphed into Super Fighters (the first mixed martial arts league, long before it was labeled MMA). Thirty years before the UFC gained a mainstream audience, KDKA-TV dubbed CV’s new sport, “Organized, Legalized, Street fighting” while the Philadelphia Journal proclaimed, “No holds barred as Superfighters take over.” Take a journey back in time to the “Iron City” and meet the fighters, the foes, and the visionaries who created the modern sport of MMA.